How life arose from non-living chemicals more than 3.5 billion years ago on Earth is a still-unanswered question. The RNA world hypothesis assumes that RNA biomolecules were key players during this time as they carry genetic information and act as enzymes. However, one requirement for RNA activity is that there are a certain number of molecules within close enough proximity to one another. This would be possible if RNA was contained within a compartment, such as membraneless microdroplets (coacervates). 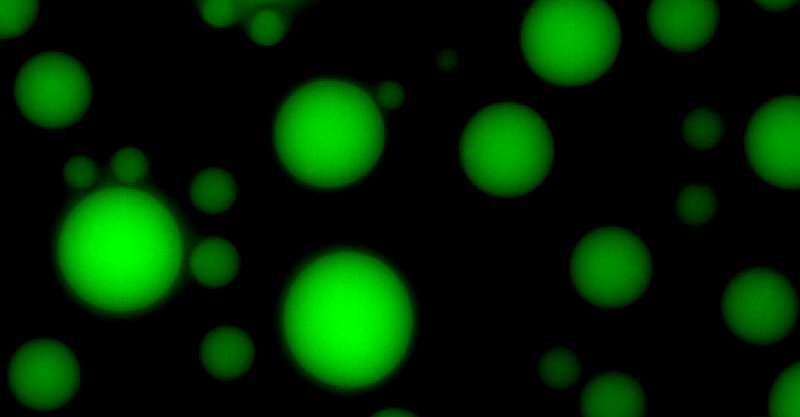 Researchers at the Max Planck Institute of Molecular Cell Biology and Genetics in Dresden and the Max Planck Institute of Biochemistry in Martinsried have shown for the first time that simple RNA is active within membraneless microdroplets, enabling a suitable environment for the beginning of life. The RNA world hypothesis assumes that life originates from self-replicating RNA, a biomolecule which was present before the evolution of DNA and proteins. However, researchers assume that on an early planet Earth concentrations of RNA and their building blocks may have been too dilute for a reaction to take place. Therefore, the scattered RNA molecules needed to find a way to one another to create a reaction and start life. Suitable places for accumulating RNA could have been within compartments. Compartments can be formed with a membrane such as the cell or without a membrane where molecules can exchange readily with their environment. Membraneless compartments can be formed by phase-separation of oppositely charged molecules, a process that is similar to the separation of oil drops in water. In their study, the researchers proved for the first time that RNA is active within such membraneless microdroplets, supporting a previous hypothesis that coacervates act as protocells and could therefore be a precursor of the cell that exists today. The ability of coacervates to accumulate RNA would have helped to overcome the dilution problem of biomolecules and offered a suitable environment for reactions with each other. Furthermore, these membraneless droplets allow free transfer of RNA between the droplets. Dr. Björn Drobot, the first author of this study, explains: "One of the really exciting things is that we have shown that coacervates act as a controlled genetic transfer system, in which shorter RNA pieces can shuttle between droplets while longer pieces are trapped in the hosting microdroplet. In this way, these protocells (coacervates) have the ability to transfer genetic information between other protocells which would have been an important criterion for starting life." Those findings show that membraneless microdroplets are beneficial for a selective accumulation of RNA. Dr. Dora Tang, who led the project points out: "It was hypothesized by a Russian scientist (Oparin) in the 1920s that coacervate droplets could have been the first compartments on earth and existed before cells with a membrane evolved. They provide a way for biomolecules to concentrate create the first life on Earth. The study from my lab adds to a body of work from us and others where there is increasing evidence that coacervates are interesting systems for compartmentalization in origin of life studies as well as studies in modern biology and synthetic biology." Great job, but, still a scientific wrong worldview is avoiding to see the obvious here. From where Nature got the mechanism of self-replication? What else was - in the state of the world at that time and before that time - doing self-replication ? What means, which is the natural force, that produces the function of self-replication? Who drove the terrestrial atoms composing rocks, water, air, suddenly to such never seen before new connections that produced biomolecules? And why complex biomolecules? The Answer is still in Genesis 1. Life is too irreducibly complex, miniaturized, environment dependent, fragile, specified, integrated and coded information dependent to arise by random natural processes. Only an instantaneous supernatural origin can explain the origin of life. Precisely!! But the answers in Genesis1 and the following verses that dealt with the actual Creation had been misrepresented by its writers who did not follow 'word for word' dictation from the Spirit forms who had told them what to write, and of which the writers chose to misrepresent by not explaining the proper sequences and in more details. In other words, the human desire to obfuscate had won over the Full Truth. Thus, it became a loosely worded conglomeration of what should have been the 'history of the Creation' that, in the millennia to come after, confused and distorted to the readers what should have been a beautiful and accurate telling of how God created everything. Humans, probably due to the DNA that they share with animals, tend to take most anything at 'face value', and only the rare breed will see the value in exploring further what they have read - getting into the heart of the matter to discover the true framework in its glorious detail. The greater majority who have read the Bible and misunderstood, then rejected it, including those who scoff at Genesis1 in the Bible and those who are unbelievers/atheists by nature, particularly those who curse God the Creator, will not be denied their just and rightful rewards. But misunderstandings are not an excuse to commit what are regarded as Sins against God and mankind - for man, as a sentient being, has the ability to discuss and read between the lines of what has been written in the Bible, particularly in Genesis1 and following verses/chapters. And Genesis1 all the way up to Abraham regards ALL of humanity - not just Hebrews. Life is fleetingly short and eternity is long. So God created everything, then could not find scribes to accurately record His word and pass it down? (Or do it Himself clearly and unambiguously to all people??) Riiiiiiight. There is much misunderstanding of the Bible, that God is the one who wrote the Book - or dictated the history to the writers. No such thing. When I said "Spirit forms" I was not talking about the Creator himself, but other 'entities' who also had knowledge of the Beginning. But you and all other humans are welcome to disbelieve - or whatever you choose to do. LOL Right there, both Carbon Unit and WhydeG have misinterpreted MY 3 posts in answer to another poster's statement. That is proof for the common misunderstandings, whether deliberate or not, that humanity tends to read into things, that are, in reality, only according to their own personal biases and beliefs. That is not what this research says, nor do you refer to alternatives. That membranes contributed is one possibility, coarcevates is another. But since phylogenies identify alkaline hydrothermal vents as the emergence locale and it had rock compartments, who could concentrate organics to boot according to experiments, it is a rather uninteresting question whether or not other pathways contributed. From where Nature got the mechanism of self-replication? From where did the universe got stars, planets and eventually organics laced oceans? From its mechanisms of course. Specifically phylogenies tend to identify alkaline hydrothermal vents as the emergence locale (see above), and they can do thermal cycling replication. Using enzymes you have PCR which is used routinely in labs, or if not there have been demonstrations using metal catalysts or even - slowly - spontaneous reactions. ""How life arose from non-living chemicals more than 3.5 billion years ago on Earth is a still-unanswered question. The RNA world hypothesis assumes that RNA biomolecules were key players during this time as they carry genetic information and act as enzymes. However, one requirement for RNA activity is that there are a certain number of molecules within close enough proximity to one another. This would be possible if RNA was contained within a compartment, such as membraneless microdroplets (coacervates)."" Genetic information can only be handed down from a previous generation, which is why it is called Genetic. Genes and RNA biomolecules can't be made available to a coacervate, unless it had acquired it from a living source of RNA biomolecules, such as infusing it and then expecting the molecules to become a living life form. This research is full of only hypotheticals and expectations, and will not create Life from non life however long it is attempted. Routinely on science sites we see magic babbling, falsehood spouting superstitious religious people who stroke their own egos - since they cannot expect that their act will "convert" anyone else. Everyone wish they would stop ... they never will. But it is a good reminder that Europe recently went majorly non-religious, because religion is not an alternative to science. You posted this falsehood right after I posted a reference showing a pathway from geology over the half alive, still not entirely genetic trait using, last universal common ancestor to extant life. But more generally, that is *precisely* what evolution shows does not happen. The genome of the next generation randomly changes (drifts) or learns (selection), which is why genetic information comes and goes - aka "evolution". "posted a reference showing a pathway from geology over the half alive, still not entirely genetic trait using, last universal common ancestor to extant life." You are engaging in Double-Speak. What exactly is a "last universal common ancestor"? There is NO pathway in geology from something that is "half alive". Either it is fully alive or it is not (dead), or has never been alive . A last common ancestor?? If the object had a "last common ancestor", then the genes/RNA from it would have been handed down/passed on to that new generation life form. If the ancestor had gone through the process of evolving, that too would be passed onto the offspring. I have no idea of whom you speak in this science site. Certainly I/we have no intention whatsoever of converting ANYONE to Creationism, as that would be a major infringement of the Law that all of humanity is free to exercise their Free Will to make their own choices and whatever may come of it. Only an instantaneous supernatural origin can explain the origin of life. Where do supernatural agents live? By what forces do they apply their influence? What is the mechanism of their agency? How do you recognize them? That information may have come from skin cells, blood or any other source that was once a part of living matter. Chemicals in water or a slimy substance may be composed of necessary nutrients and other chemistry that could 'kick-start' the processes whereby a unicellular life form might later emerge, but chemistry, of and by itself, cannot and does not produce LIFE as the end product. Once you understand that basic principle, then you can understand also that Evolution is a byproduct of that emergence of Life, and that Chemicals, no matter how accurate in quantity and quality they are - gathered in one place - will NOT bring forth LIFE even if pushed and shoved into the shape of an coacervate, or whatever shape/membrane or membraneless configuration that they can dream up. BTW - my ego is none of your concern. Why do you ask? You, who have appeared to negate the presence on Earth and elsewhere of that which your eyes and instruments are unable to detect. Is it just curiosity or do you seek some amusement to while away your time in this website and life in general? They were here long before even the first unicellular life form emerged from the deep. And they were already here to witness the birth of the Star which you refer to as the Sun. And they were already here when the first man was created by the Creator of everything. Matter is a creation out of Quantum particles which can be manipulated, as man is currently trying to do, as though man is competing with God to outdo Him. Man is so foolish - and Satan understands this. Genes and RNA biomolecules can't be made available to a coacervate, unless it had acquired it from a living source of RNA biomolecules, such as infusing it and then expecting the molecules to become a living life form. Please elaborate on how RNAs are formed; so that we can all be up to speed. Those findings show that membraneless microdroplets are beneficial for a selective accumulation of RNA. Please provide a manner of proof for things the eyes and instruments fail to detect. What the religionistas forget is that everything they claim is based on inference. Were they standing there watching the super magic sky daddy make anything at all? Why do you ask? . . . Is it just curiosity or do you seek some amusement to while away your time in this website and life in general? There's nothing amusing about your insistence on supernatural agency. Nor is there anything of value in your reply, especially where physics is concerned. The fact that you insist on posting this BS here only shows you to be a rank provocateur. The religionist response to evidence is faith. Faith is belief despite evidence. Faith is the disdain for evidence. A brilliant invention - it celebrates the rejection of reason and evidence. It rewards ignorance and superstition with the assurance that if you hold out, not only will you get everything you ever wanted but you get to live forever in paradise. And it only takes a biscuit to get a dog to do tricks for you. "Luther also urged that "safe-conduct on the highways be abolished completely for the Jews," and that "all cash and treasure of silver and gold be taken from them." What Jews could do was to have "a flail, an ax, a hoe, a spade" put into their hands so "young, strong Jews and Jewesses" could "earn their bread in the sweat of their brow."" -which gives an indication of what the religions all require for all that goodness and mercy they wish to bestow upon you. Nothing is free. One would expect that the price of immortality to be among the steepest. But what the heck - we're all slaves of the living god so the jews should be happy for the chance to serve. Zealotry in faith has often resulted in a bloody stain on human history... but broadly coloring religion by the words of one of history's most cantankerous characters is probably a little unfair. Mendel, regarded as a founding father of genetics was a friar and an abbot(?). Some people get the allegorical nature of their book(s) and some don't, much to the detriment of those around them. You still haven't given me a good enough answer. Why do you ask? I am not trying to be amusing when I asked you that question. It happens that the title of the article is: "ORIGIN OF LIFE in membraneless protocells". I am in this forum to see what lies are being told wrt the Origin of Life. The gist of the story is that, in their opinion, life can be created solely by chemical means. If that were the case, then there should be evidence of chemically-induced life everywhere there are such chemicals even NOW. RNA contains the genetic information that is required for all cells. You have over a trillion in your own body. That information can't come from something that has never had life previously. The researchers have acquired the RNA they are using, from an organism, whether alive or has died. They transplanted the RNA into a micro droplet, and then waited for it to come alive. It didn't and it won't. But they will keep trying and keep failing. There is no such thing as Membraneless organisms. And there has been no such occurrence anywhere in Nature of a membraneless cell that has the ability to evolve into a multicellular life form. Chemicals, even with water and a source of heat is not enough to create LIFE. Researchers will try anything - almost out of desperation. Sad. And why do they want to accumulate RNA in a membraneless micro droplet? It is completely illogical. You do realise, don't you, that by making such statements in favour of religion, even in a broader sense, that you may make enemies in this forum - those who are haters of religions and the Creator? There is much hate toward Christianity, even Jews, but I have yet to see/read any hatred toward the murderous Muslims who are streaming into Europe and the UK, bringing their religious beliefs into these nations and threatening to take over and convert them or kill them. I am certain that these Muslims will accomplish their goals. It will be fun to watch how it happens. It sounds like you have confused DNA with RNA; and there is nothing in the press release or the cited paper about trying to bring anything to life. Actually, no I didn't confuse the two. RNA = information and ? Both are amazing structures, don't you think? They are attempting to find that key to creating life. Its IN the BOOKS. The books ARE the religions. And the religions never change their BOOKS. And so eventually, as always, the worst will come out. God demands it. 'Allegory'. One of the more disgusting apologetics. Are the 10 commandments allegorical? Who gets to choose what is allegorical and what is not? Where in the bible is the distinction made between option and mandate? Nowhere. The gospel of john says the jews killed christ. The Torah itself is explicit on how to treat blasphemers and proselytizers and wayward women and insolent children and slaves. And efforts to remove them by cute progressive translations and clever reinterpretations is especially foul. We all know what god said and what he wants. I don't think I've ever seen a Muslim proselytize in a commentary on Physorg before. It's the arrogance, lack of hubris and open-mindedness that we've seen Christians and Creationists imbue in their comments. It's like they've come in looking to start an argument. If we've gone from inorganic origin of life to insulting religion, it sounds like the religionists are butthurt again. So, gonna burn some more people at the stake? Just askin'. And while I'm askin', isn't that what the Taliban and Daesh do? Sorry the Taliban and Daesh are butthurt because people look through telescopes. Get over it. It's like they've come in looking to start an argument. Their faith is less than perfect so they harbor niggling doubts that disturb them to their cores. So, they have to constantly work at convincing themselves that what they believe is "true." As part of that, they come here to argue their faith. They also come to experience persecution. The persecution bit is part of a martyr syndrome- nothing like being persecuted for your beliefs to give one a sense of validation by "suffering" like their ultimate martyr. It's really rather perverse. Try reading what I have already posted about the writers of Genesis. The writers were men and men have Free Will and it is their Free Will that they exercised to write only according to what their interpretations of what was dictated to them. God Himself did not "write" the Bible, as SpookyOtto seems to claim. The Creator left it to man to write, and for Angels to guide them in that writing. But man always thinks he knows best - thereby confusing those who later read Genesis. Another thing: The Genesis portion of the Bible is about ALL of mankind - up until Abraham comes into the picture. From then on, the Bible is STRICTLY a Jewish story of the Hebrews and their history. Did you forget that IGNORE button over there >>>>>? The vast majority are Religionists, not Creationists. Again, I will have to tell you that religions began long after the creation of man, the creation of other life, and the creation of the Universe. Do try to remember this time. Do you REALLY think that one day a Muslim will come in to physorg to proselytise for converts to his religion? That's a new one on me, as I did not suggest such a thing - or ever even thought it could happen. Unless they like science. The Creator left it to man to write, and for Angels to guide them in that writing. Angels guide my writing too, and told me you're an utter dork. I have to leave now, I have supernatural mechanics working on my Vimana and it's ready to pick up, I'm flying to Heaven in the morning for breakfast with Elvis then picking up my grandkids back here on Earth after school. so, now you're taking to threatening children because you dislike someone? And do try to remember that what you wrote has no basis in reality. The "creation" you refer to is a fictitious concept not present in the real world. In addition to many colorful personas (pirouette, russkiye, obamasocks, pussycat eyes, etc), pussytard enjoys rewriting the bible to suit her predelictions. -Of course all xians do this, even the most demented and dimwitted of them. Its a personal god after all.